After winning a tough tryout against other young dirt-track racers, Trace Bonham scores an amazing ride. A corporate sponsor chooses him to drive its brand new Super Stock. And what a great car it is! Along with a professional crew, a top-of-the line car hauler, not to mention money and fame—it all feels too good to be true…. And there’s a price to pay. Trace has to leave behind his girl, his high school, and his hometown speedway. His life is shifting into high gear, and he has the driving skills to make it big—maybe all the way to NASCAR. But does he have what it takes to handle road life and the speed of his success? It took him a few minutes with the kids, signing autographs, and when he was finally done he turned to go back to the pits. For some reason he looked into the shadows, alongside the bleachers. Leaning against the metal wall was April, smiling at him. She worked at the concessions stands, and was a college girl. “Hey,” he said, and walked over. “Some driving tonight!” she said. She stepped very close. He could smell food on her: sweet corn, butter, taco sauce, cotton candy. She touched his face. “I could punch out any time,” she murmured. “And?” April asked. She let hand track slowly down over his chest. “Just my luck!” April said. “Hey, you don’t look like the kind of girl who needs any luck,” Trace answered. He glanced around, then pulled her sharply forward and kissed her…. 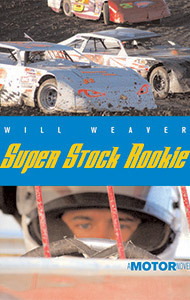 Super Stock Rookie, the second Motor Novel, follows Trace’s rapid arc upward in dirt track racing. The matter of success—how he handles it—is a central theme. We’ve all read about people who have crashed and burned because of too much success. For Trace, it’s the best car, the best team, and hot girls (“fence bunnies”) everywhere–a life of the pro racer on the road. But there’s a girl back home, and serious questions his about sponsor and crew. Is he a winning driver or a cheater—in every way?